Indian Army Recruitment Notification 2017 for 75 MTS, LDC Posts. 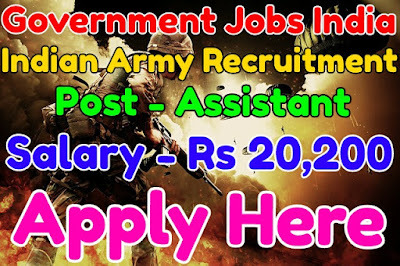 Indian army has published recruitment notification 2017 for 75 cook, MTS posts. All legible and interested candidates have to apply on or before (17-02-2017). Further more information about given posts is mentioned in detailed below. Number of vacancies - 75. Age Limit - A candidate age should be less than 45 years. To know more about age details click on detailed advertisement. Selection Method - A candidate will be selected on the basis of their performance in skill, written and physical endurance test.